To say REKS took the underground rap scene by storm would be an understatement, as over the course of his first decade on the scene he was the definition of consistent, unleashing three consecutive albums that firmly established him as one of hip-hop's most revered new artists: Along Came The Chosen, Grey Hairs (primarily produced by Statik Selektah with additional production from DJ Premier & Large Professor), Rhythmatic Eternal King Supreme (which debuted on the Billboard charts and included production from Statik Selektah, DJ Premier, Pete Rock, Hi-Tek, Nottz, Sha Money XL & Sean C & LV). Rather than resting on his laurels, REKS choose to take his artistic direction and vision in another direction, devoting his time and energy to embark on a new mission working on passion projects (REBELutionary, Revolution Cocktail & Eyes Watching God); all of which foreshadowed many of the societal ails that we as a country and now fully embroiled in. 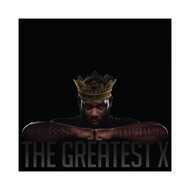 While REKS' The Greatest X (pronounced as The Greatest Unknown) is not a comeback album, it is a return to force for the Boston wordsmith. As he did on his previous stand-out efforts, REKS is back working with the industries elite producers (Large Professor, The Alchemist, Evidence, Statik Selektah, Nottz, Apollo Brown, Black Milk, Buckwild, Streetrunner) as he sets out to take the next step in his progression. REKS has already set things in motion with the release of videos for the Streetrunner produced "Hands Up" (Wink Wink), the Nottz produced "The Recipe," "Jump Shots" (produced by Buckwild) and "B*tch Slap" f/ R.A. The Rugged Man, which have all been favorably received.